Yesterday (14 December) the Deputy Prime Minister of the Republic of Poland, Mateusz Morawiecki, met with representatives of the Polish community as a part of his one-day-long visit to Vilnius. 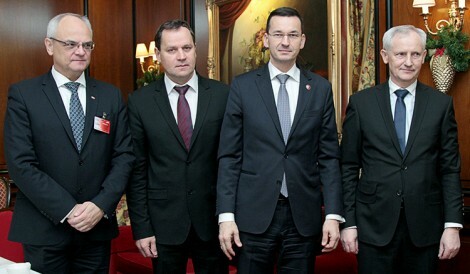 The meeting, held at the Narutis hotel in Vilnius, was attended by MEP Waldemar Tomaszewski, leader of Electoral Action of Poles in Lithuania, Czesław Okińczyc, signatory of the Act of Independence of Lithuania, Jan Dziedziczak, Minister of State of the Ministry of Foreign Affairs of the Republic of Poland, Jarosław Czubiński, Ambassador of the Republic of Poland in Lithuania and counsellor-minister Henryk Szymański, the head of Promotion and Trade department of the Embassy of the Republic of Poland in Vilnius. The topic of the private gathering was Polish-Lithuanian relations, problems of Poles in Lithuania as well as the need for improved trade relations between Poland and Lithuania. After the meeting, Waldemar Tomaszewski told journalists that the Deputy Prime Minister congratulated the Association of Poles in Lithuania and EAPL for their determination, strong convictions and their success. He also expressed his gratitude for their caring for all things Polish in Lithuania. “We also broached the subject of the Polish-Lithuanian Treaty of 1994 which, unfortunately, is not being implemented in many aspects.” – emphasized Waldemar Tomaszewski. Meanwhile, Czesław Okińczyc paid attention to the fact that plurality in the Polish community is important and valuable. He stressed that different approaches to solving a problem should not be treated as an attempt to shatter the unity of the Polish community. „I am glad that the Deputy Prime Minister noticed that there are many view points on the functioning of the Polish community in Lithuania as well as on the way Polish-Lithuanian relations should develop. Despite the fact that existing problems are not perceived differently, their solving requires various tactics and strategies. Due to that, we should be open-minded and willing to talk with everyone” – said Czesław Okińczyc. The signatory of the Act of Independence of Lithuania added that Deputy Prime Minister Morawiecki was interested in new investment projects between Poland and Lithuania.